The Syrian uprising started in spring 2011 with peaceful anti-government demonstrations claiming for legal, economic and political reforms. Influenced by similar events in other Arab countries at the time, it was met with violence and repression by the Army and pro-government militias. President Assad announced limited steps towards reform but violence grew, and has done steadily up to now. There is no possible understanding of the events in Syria without having in mind the myriad of regional and international interests and agendas being played here and strongly influencing the course of events. Syria is the scenery of a geopolitical game that has transformed this country in a proxy war similar to those of the Cold War. Foreign agendas have transformed Syria in a zero-sum game in which each actor fights fiercely for strategic interests and contribute with diplomatic, financial and even military support to exacerbate the conflict and to polarization of all sides on the ground. Given the complexity of the interests at stake, I don’t pretend to cover the whole range here. This is just a brief approximation that hopefully serves to have a first insight into internal and external players and their agendas. At the end of this post you fill find a list of official documents about this conflict. Following his father 30 years term, Bashar al-Assad assumed power in 2000. Commander of the Syrian Army and president of the Ba’ath Party, he was expected by some as a reformer who would undertake political reforms towards more rights and freedom. The Assad rule in Syria is secular and autocratic, maintaining the country strategic role in the Middle East through regional alliances with Iran, Hamas in Palestine and Hezbollah in Lebanon. The regime has been politically repressive but religiously tolerant in a traditionally secular country. Holding power for the Alawite Muslim minority, it is largely supported by other religious minorities and by large parts of urban middle classes. Other supporters of the regime include the Army, public sector, some business constituencies and professional unions. What is appalling for many Syrians is the need to choose between the regime and a divided and polarized opposition, while facing a humanitarian crisis and a disastrous economic situation. Religious factors have come to play a role as seculars and some minorities fear the political intentions (and potential retaliation) of some rebel groups. Opposition groups (armed and not) are far from sharing opinions with regards to the political future. Rivalries have soared among those who oppose the government: local leaders and exiles, militia commanders on the ground, and between those who seek accommodation with elements of the current structures and those who seek to bring down the entire regime. Islamist and secular activists at odds, while Kurd groups seek autonomy and armed extremist groups gain military strength on the ground. Although even the main groups are far from unified, there have been attempts to create a united opposition front. The Syrian National Council (SNC) was formed in 2011 in Turkey and included a variety of groups, mainly with ideological ties with the Muslim Brotherhood. In November 2012, the US and other countries facilitated the creation of the Syrian National Coalition for Opposition and Revolutionary Forces, an umbrella of groups seeking to overthrow the regime through political means and armed struggle and to become a transitional governing body after the regime’s collapse. Recognized by the Cooperation Council of the Gulf, the Arab League (except for Iraq, Algeria and Lebanon) and NATO countries such as France, UK, the US, and Turkey. The Free Syrian Army is the main armed group, born in June 2011. Formed by Army defectors it was later joined by local militias and civilians, but apparently remains a loosely collection of scattered militias lacking unified structure and a coherent ideology. It is thought to have around 100,000 troops. The Al Nusra Front emerged at the beginning of 2012. Still a minority among the opposition, it includes religious militant groups and foreign jihadist fighters. It has links with Al Qaeda in Iraq and recruits at home and abroad to fight for an Islamic State. Blacklisted as a terrorist organization by the US State Department in late 2012, their ruthlessness and brutal tactics have raised the stakes in the Syrian groups. Other Salafist groups have emerged later in this complex landscape. Finally, a number of Kurdish militias joined the Democratic Union Party in mid-2012 and began taking over majority Kurdish towns in the north and east of the country, raising tensions with the Turkey government. Recently they have rallied against armed Islamist groups. Syria has been seen as a danger for US interests since its independence. Syria supported the Palestinian cause, fought three wars with Israel and have kept tensions open for the Golan Heights. The alliance with the Soviet Union added to this rivalry that has expressed more recently by affairs in Lebanon (with Syrian support for Hezbollah) and Palestine (with support for Hamas). Political circles have long considered Syria a main rival for the US interests in a key political region as the Middle East. The Economist takes position here in an illustrative way. Even clearer this analysis of the Hoover Institution. Current geopolitical interest and historical reasons merge even more in the UK and France cases (both were at any time colonial rulers over Syrian territory”. The UK and France share with the US the Western interest over the Middle East and geopolitical competition with Russia and China, and seek to replace the Assad regime with a pro-Western one (a movement that would also serve to weaken Iran). For the UK there is also the “strategic alliance” with the US. And France seeks long-term interests and a need to boost its international image. In May 2013 France and the UK successfully lobbied for the EU’s arms embargo to be lifted (so as to allow further supplies to the rebels). One of the most important international backers of the government, it has extensive trade and strategic interests many of which go back to the Soviet Union era. Syria, at odds with the West since independence in 1946 and feeling vulnerable in face of some neighbors (the US backed Israel, among others) got Moscow support. Russia exports large amounts of weapons to Syria and increasing amounts of small arms. Trade ties are linked to oil, grains and technological equipment, among other supplies. The Syria port of Tartous is the only Russia navy outpost in the Mediterranean, now a permanent base. Defending Syria is also part of a general principle of non-interference in internal affairs that also serves Russian internal interests. Russia supported the peace plan presented by the joint UN-Arab League envoy KofiAnnan as a way to reach a political solution, has explored other options, and has finally reached an agreement with the US about the Syrian chemical arsenal. China has joined Russia in blocking resolutions critical of Syria at the UN Security Council. It was also critic of the prospect of military strikes. Although it has no strategic interests in Syria, it may have taken a stand for a mix of reasons, including a more assertive foreign policy; concern over the Islamist component among the rebel groups; outrage about past events in Syria (were NATO intervention went far beyond what the UN had authorized) and a shared concern with Russia about Western interference in Middle East affairs. Turkey had peaceful but distant relations with the Syrian government for years and attempted to convince al-Assad of the need to initiate reforms. Since the beginning of the conflict it has been one of the most prominent critics of the government. Heavily affected by violence at the border, the Parliament authorized cross-border action as a response at the end of 2012. It hosts political refugees and some of the political and armed opposition groups (especially those linked to the Muslim Brotherhood). Developments associated with the situation of Kurdish minorities in Syria are another fact in this equation. Public opinion is reluctant to openly intervene in Syrian affairs. For years, one of the main rivals of the Syrian government with regards to regional preeminence. Very active in pursuing and advocating military action against the regime it supports armed opposition groups, mainly the Salafist ones. Being Iran its main rival in the fight for geopolitical hegemony in the Gulf and the Middle East, the Saudi objective is breaking up the Syria-Iran alliance. They also compete in support for opposing groups (with Syria supporting Hezbollah) and Palestine (where Syria supports Hamas while Saudis hold those groups, like Fatah, in favor of a negotiated peace deal with Israel). Finally, the Saudi regime sees itself as a defender of Sunnis in the Muslim world against Shia (ruling Syria and Iran and also an important internal minority in Saudi Arabia). Main supplier of weapons to Syrian rebels, it is thought to have provided them around 1-3 billion dollars in aid. The Qatari single-minded support to anyone with a possibility to bring down the House of Assad has negatively impacted the legitimacy of opposition groups. Saudi-Qatari rivalries, rooted in the their different experiences with the Muslim Brotherhood and their different reactions to the 2011 pro democracy uprisings across the Arab world, have further helped to fragment the Syrian opposition coalition. Opportunistic Jihadist groups have exploited this access to arms and money. Hostility with Syria goes back to the creation of both countries in late 1940s due to Syrian support for the Palestinian resistance and subsequent wars (1948, 1967 and 1973). Israel holds control of Syrian Golan Heights. Over years Syria has maintained pressure over Israel not by direct confrontation but by supporting Hezbollah in Lebanon and Hamas in Palestine. Israel was expected to be a beneficiary of the fall of Assad but the current composition and ideological orientation of some opposition groups makes the future look uncertain. It is no good news for Israel if Syria becomes a safe haven for extremist and Islamist militant groups. The Army considers limited cross-border incursions to secure a buffer zone and prevent the shelling of Israeli territory from Syria. By early 2013, clashes between Syrian rebels and government troops spread to the Israeli border, with artillery shells frequently falling on the Israeli territory. Israel retaliated with an air strike. There is deep division in the country between supporters and opponents of President Assad. The Syrian war has potentially deep impact here. The Shiite majority, mostly represented by Hezbollah, has in Assad its closest ally, while many Sunnis sympathize with the rebels and Christian population is divided. Due to the power system in Lebanon that holds posts shared by the three main religious groups, the Syrian situation impacts in Lebanese political balances. The north of the country is a host for Syrian refugees, deserters and rebel groups, mostly welcomed by the Sunni population. At times tensions rise as in the city of Tripoli, between Sunnis and the Alawite (pro-Assad) minority that also resonate in the south. But the majority of Lebanese Sunnis are secular and only some Islamists have joined the fight in Syria. The Lebanese Army remains neutral. Jordan has received half a million Syrian refugees. The government has called for a political solution but is also believed to have provided weapons to rebel groups in early 2013. 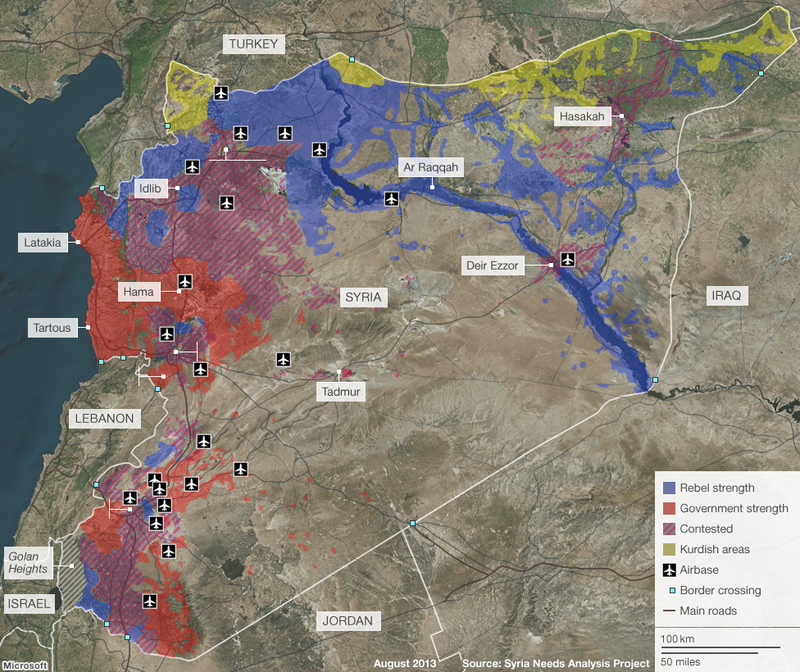 Fear for spillover of the Syrian conflict and internal destabilization domains. When international intervention was in sight, the government backed a limited military action if the use of chemical weapons was proved, although limited to the arsenals. Iran has been for a long time the main regional Syrian ally. Both countries share a wide range of interests: support for Palestinian group Hamas; support for Hezbollah in Lebanon and Israel as a common enemy, as well as geopolitical preeminence in the Middle East. More recently, when the US invaded Iraq in 2003, both countries wanted to avoid the establishment of an US dependent regime in Baghdad. Iran developed a close relationship with Shiite political parties (and later with the government) in Iraq. The changing and unstable internal political situation in Egypt has a deep impact in regional alliances. The now overthrown government of Mohammed Morsi stood against the Syrian regime, cut off relations with the country and called for a no-fly zone (remember the role of the Muslim Brotherhood in Syrian rebel groups). But after the coup, the military-backed current government seems very wary of any to rebel groups and has rejected intervention without UN authorization. The changing Egyptian position mirrors changes in internal politics. The UN monitors the situation in Syria with the deployment of peace envoys and inspectors of disarmament. The Security Council has been unable to agree on how to stop violence for the different interests held by its five permanent members (UK, France and the US on one side, and China and Russia on the other). Former UN Secretary General Kofi Annan was appointed as the UN-Arab League Peace Envoy and presented a peace plan in May 2012. The proposal included a Syrian-led political process; UN supervision of the cessation of armed violence by all parties; allow the provision of humanitarian assistance to all areas; intensify the release of persons arbitrarily detained; access to the whole country for journalists and respect for the rights of association and demonstration. The document was presented in March 2012 and by April there was a ceasefire. The UN Mission on Syria was deployed then, but it lacked leverage over the parties and the agreement was soon broken. The plan was a political compromise that seek to stabilize the situation to allow Syrians to advance political negotiations. But 2012 was probably too late for Syrian parties to agree on anything, as polarization had soared (and has not stopped up to now). Annan resigned in August 2012 and was followed in this position by the Algerian diplomat LakhdarBrahimi. Neither of them have succeeded, although both have probably offered the most realistic and comprehensive analysis of the situation and of the possible solution (recognized as a necessarily regional political process and agreement). One additional reflection: Is this a religious conflict? According to experts, the answer is no… at the beginning. The question at stake was the continuity of the regime. But some minorities were more supportive of it than others and this factor influenced political alignments. The religious factor coupled with those political positions has been used to fuel intolerance in some parts of this (formerly secular) country. The emergence among the rebel groups of Islamist and Salafist militias (both Syrian born and foreign fighters), and even Al Qaeda linked groups, that fight for an Islamic state, have further polarized positions. The roles of Saudi Arabia and Iran in the regional setting, exploiting the Sunni-Shia factor, only added complexity. Nowadays, the religious element must not be discarded. It may seem a hopeless conclusion for this post series but, after reviewing the Syrian humanitarian situation, the possibilities of (and some reasons behind) a military attack, and the complex game of interests that are at stake in Syria, one main question comes to mind. Who cares for the Syrian people? Esta entrada fue publicada en Conflictos, Construcción de la paz, English y etiquetada armed conflict, Middle East, Syria, UN, US por Mabel González Bustelo. Guarda enlace permanente.